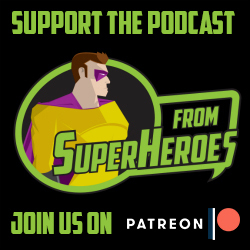 Talk From Superheroes: 39: Agents of S.H.I.E.L.D. Season 4 of Marvel's Agents of S.H.I.E.L.D. has come and it's picked up a man who sold his soul to the devil. Andrew and Diana have maybe too much fun talking about the arrival of Ghost Rider to Agents of S.H.I.E.L.D, while breaking down how the show has changed over the years, the roller coaster that is Sky/Daisy/Quake and WHAT THE HELL EVER HAPPENED TO PATTON OSWALT!? SPOILER WARNING: This episode contains talk about up to Season 4, Episode 4 of Agents of SHIELD and references to prior seasons. Come back next week for our fan voted Halloween special, Constantine. I had actually assumed that all of the Oswalds were clones and they just didn't know it. Like Fury had given them all memories or something. Like a trial run for giving other people fake memories during the Tahitti project.